Does my ATV, sandrail,dirtbike, pitbike, golf cart, etc need a sticker or some sort of registration registration there? Are there noise restrictions at Dumont and are spark arrestors required? Technically, all vehicles must have a muffler or spark arrestor. However, this is not a very strictly enforced rule. Do I need more than one pass if I have more than one rig in my group? Yes. A pass is required for every vehicle or rig entering and exiting Dumont Dunes. What areas of camp are soft and is it easy to get stuck with my truck or RV? Soft areas to avoid. (refer to grid map below): A7, A8, A11, top left of B9, top left of C5, and anywhere very close to the finger dunes. Some high traffic areas in between camps can sometime get churned up and fairly soft. Just stay on the gas and you will be fine. The camp area is usually fairly hard packed. No. As long as you stay away from the soft areas you should be fine. IF you get stuck, don't bury your rig even more. As soon as you know you aren't going anywhere, let off the gas. Some duners air their truck tires down (~15psi) and can usually pull right out. Don't forget to air back up though! Are there designated camp spots? No. Just pull in, pick an area, and set up camp. The camp area is a huge, open flat area. There are no campgrounds or spots to reserve or pay for. Where is the best spot to camp for kids? Either Little Dumont, or out away from congested areas like the finger dunes . You must supervise your kids at all times. Most duners with kids prefer camping in areas out near bathroom 3 or 12 away from others. Who do I contact if I want to hold an organized event or sell items at vendor row at Dumont Dunes? 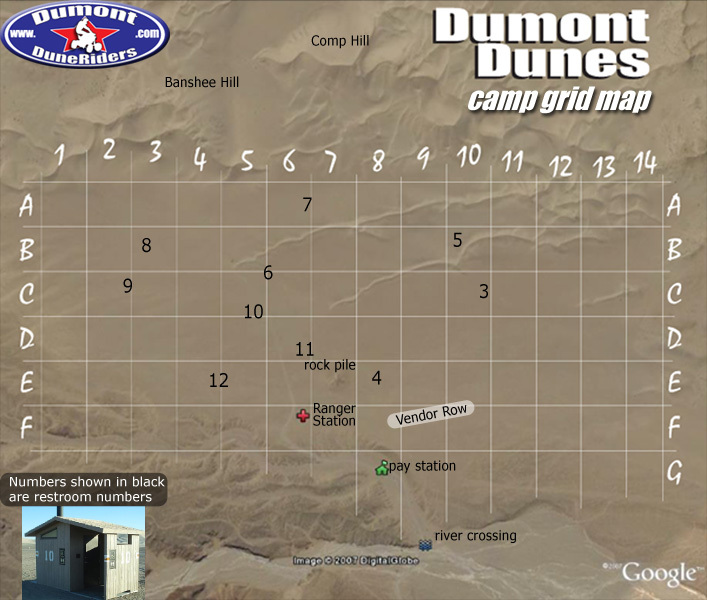 For more information on Dumont Dunes, just visit our forum. Once registered and logged in, just click "New Topic" in the appropriate section and ask whatever it is you are looking for. Someone will be glad to help you.